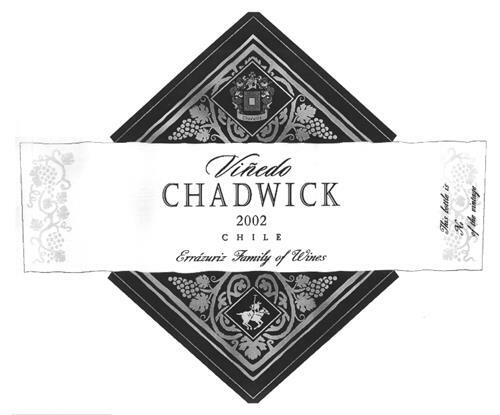 On Tuesday, July 22, 2003, a canadian trademark registration was filed for VIÑEDO CHADWICK & DESIGN by VIÑA ERRAZURIZ S.A. Edif. World Trade Center, Av. Nueva Tajamar Nº 481, Of. Nº 503, Torre Sur, 5º Piso, CHILE . The Canadian IP office has given the trademark application number of 1185297. The current status of this trademark filing is Registration published. The correspondent listed for VIÑEDO CHADWICK & DESIGN is NORTON ROSE FULBRIGHT CANADA L of 1, Place Ville Marie, Suite 2500, Montreal, QUEBEC, CANADA H3B1R1 The VIÑEDO CHADWICK & DESIGN trademark is filed in the description of Wines. .
Mark Disclaimer: The right to the exclusive use of all the reading matter except ERRAZURIZ FAMILY OF is disclaimed apart from the trade-mark. (3) Other emblems or insignia -- Notes:	(a) Including evil eye. -- (b) Not including representations of the serpent and cup (3.11.1), the serpent and staff (3.11.1), imperial eagles (3.7.1) and torches (13.1.5). (4) Labels, collarettes (bottle-neck labels) -- Note: Not including tie-on labels (20.5.15). (11) Decorations of vine branches -- Note: Not including vine shoots (5.3.19).